A compressor pedal incorporating the best attributes of classic pedals while simultaneously eliminating the shortcomings common to such vintage designs. Included are controls for the adjustment of Attack, Release, and Ratio that allow the user precise and continuous variation to their sound. These controls offer the ability to custom tailor the effect to match the job at hand. No matter what style or instrument, the perfect amount of compression is easily dialed in with minimal coloration to the original signal. The CA3080 is a discontinued IC, and although it is still available from a number of sources it will get more difficult to obtain as time goes by. After the discussions below, the circuit was tested by G5120fx with an LM13700 replacing the discontinued IC and it worked fine. Unfortunately this IC is 16 pin instead of 8 because it is 2 channel and includes buffers, but if you find that you can get the LM13700 cheaper or more readily then you can use the following daughterboard to allow you to use that IC. Just solder the wires to where the CA3080 pins would be on the main board. This daughterboard can be used with any of the effects in this blog which use the CA3080, including the MXR DynaComp, Ross Compressor and Keeley Compressor. Wow Mark, you´re on fire! Very busy at the moment! Damn those 3080s are expensive. I know.. Like in this case, the price is always subjective. I've read around, and seems that last manufacturer stopped making these OTAs (operational transconductance amplifiers) in 2005. There seems to be plenty around, but as they have been obsolete for 7 years the price is high. And it's not hard to understand why. If people are interested in sourcing those, check Polida and goodbuy711 on ebay. Just grabbed me a bunch of these and i hope they will be all i need for cloning compressors for the rest of my life. One thing's for sure. Obsolete components aren't getting cheaper by time - unless some company starts to make modern equilevant.. And that doesn't seem to be happening anytime soon. Yes you could use an LM13700, it's basically just two CA3080 type OTA's and also includes buffers on separate pins, but you could just ignore the extras. 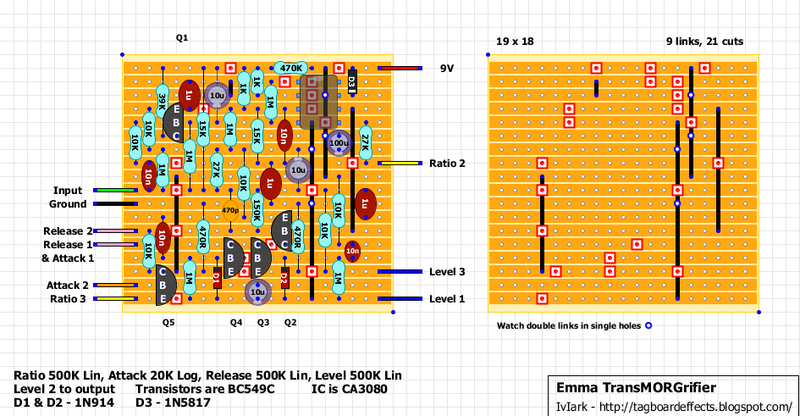 The only reason I haven't bothered is there's not a lot of difference in price if you buy from Polida, and I'd need to accomodate a 16pin IC instead of 8 which would make the layout bigger. if i would use it for a bass guitar, have I to change any components? your vero ext week. I have definately no ca3080 at home, so I´ll try it with a LM13700. I let you know when I tried it! Yes that looks spot on to me. It'll be interesting to see if it works just as well with the LM13700, I suspect it will. 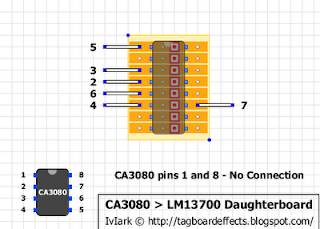 That's super cool idea to make it as a daughterboard for LM13700! Now all we need is that Mark re-draws that and links it to all four CA3080 posts! i must build this one, have a few 3080 laying around, was meant to be used for the keeley compressor, this looks more interesting for some reason! and thanks mark, you're the man as always! I made this verbatim to the layout with no subs. Works. Controls feel weird, because i'm used to seeing attack and release on synth amp envelopes and obviously those controls aren't working here as they do on synths :) Is release really 500K? That control puzzles me the most, as it is very subtle when compared to attack. Attack and Ratio maxed this one goes really wobbly. That's not a bad thing. Very usable thing this here. Pretty versatile compressor. With it's nearly massive output capabilities, it could be used just as a clean boost too. Brilliant. And yes it is a 500K in the scheme. That replaces a 150K resistor that was between Q3 and Q4 collectors and supply in the Dyna Comp, so it may have been selected so it's middle value (ish) reflected that. Maybe a 250K would be more suitable. damn you were faster.... I´ve already cut the traces, placed jumper and resistors. Good that its verfied! I will finish it tomorrow! Excellent, I'll add a daughterboard layout. Hi, Ive just built this and after connecting the power, all the trannies started smoking, I used BC549C NPNs. Im going to go back and check everything but what would the common reasons be for smoking trannies? Well. There is no common reason, as i've never got any transistors to go up in smoke. But in general, a short would probably do that. So check your strip gaps and all the trace cuts first. I'll cut through the strips with a blade and try again although one of the trannies will probably need replacing, its flat surface looks fractured. How does this compare to a Keeley 4 knob compressor? I am contemplating a compressor build and this one looks interesting. i'll be able to answer that pretty soon. i just finished the Keeley 4 knobber today and it's great. i also built the Rothwell Love Squeeze and the Armstrong Orange squeezer and all of them have been really nice sounding comps, with the Keeley being the most flexible. i just finished building and testing it (it worked perfect straight away-YAY!) and IMO, it's an awesome compressor. IMO, it's a bit more 'hi-fi' sounding than the Keeley. in a way, it kinda reminds me of a dbx 160, only in pedal form. ......and BTW, my attack and release knobs work perfectly throughout their entire range. here's a pic of mine, and i'm lovin' this one! Looks amazing like all your builds I've seen. Got a question since as a bassist I know you've modified a lot of pedals to keep the low end, did you just change the input and output caps? TransMORGrifier -> slightly modded Xotic AC Booster (clear red LEDs and more volume with 100R instead of 1K). Beutiful and versatile. Don't know if the clipping LEDs were perfect choice though. But it's still nice. 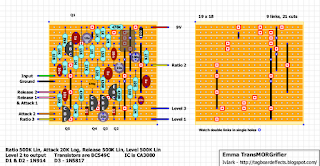 This circuit has *tons* of output, a 500K audio volume pot might be a good choice;-)... Sounds relly great, thanks again Mark for all those wonderful layouts! I have no BC549C's. I have bc109,bc184Lc,bc327, bc337, bc546b,and last but not least...bc550's anybody got a goob for the 549charlies? I have a lot of 1n'..s, 2n..'s mps.., bs.., j......NO 549C..UGH!!! Any help would be kindly appreciated. just do a google search and you can find more schematics, or check DIYSB or FSB too. When I have the output of a circuit in the Lug 2 of the Volume (or another potentiometer), what should be the "output" capacitor? I'd like to increase the capacitor value to use in the bass! hey bro. you actually don't have to do much to make this work on bass. all i did was change the 10nF input to 100nF and you're good to go. no low end loss. so far my favorite compressor. can be clean or get a sorta SVT with a hint of breakup. I plan to use it with my bass also. Do you mean we only need to change the 10nf that is linked to the input ? We leave the 3 oher 10nf unchanged ? When dialing the attack pot to a rather slow response, something starts to clip. When probing it seemed to start at the IC-output. Is this normal? If not, what could be the cure?